This wool came from an LYS in Paris, Les Tricoteurs Volants (The Flying Knitters), which is run by Enrico, and crammed full of yarns from the lesser-spotted end of the spectrum. I was there with my friends Rae, Alitzah, Gemma, Mairead, Cinthia and Emma on a day of yarn-based gallivanting that had begun as a dreamy “Let’s do Paris yarn crawl one day.” We had already been to La Bien Aimée, so full of sweet-shop colours, and stopped for lunch at the original part of Aimee’s empire, L’Oisive Thé. It was a hot July day, and I was thinking of our next stop, a nice cold cafe, when something caught my eye. High up on one of the walls, far above the colourful hanks of handspun and silk and alpaca, was an outsize skein of undyed organic wool, intriguingly labelled STOUT, from the Italian company Borgo de’ Pazzi. I’d been planning to stick to French-produced sock yarn, but this skein was a) unusual and b) about half the price. And c) I like Nigella’s Guinness cake. There was a large cowl on the counter as a sample, and its soft folds released a sheepy smell (I can’t get more precise than that, sorry — must research technical terms for wool aromas) so compulsive I bought it. 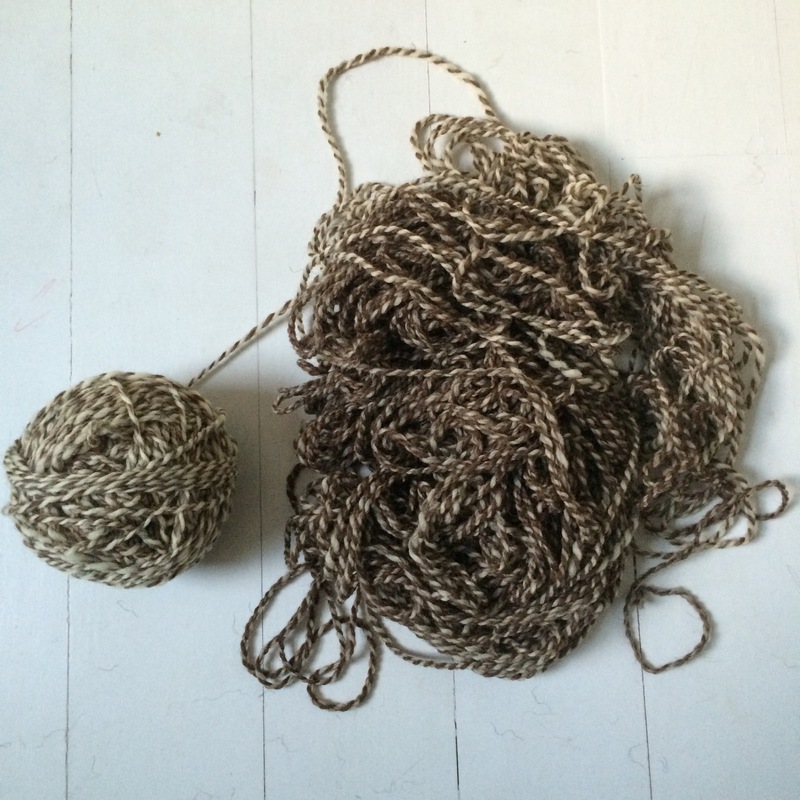 After 10 weeks of devotion to knitting with sock yarn during the #summersockskal, I fancied a change of scale, so yesterday evening I dug out the skein, snipped its ties, didn’t adequately restrain it, and it burst into the tangle below. 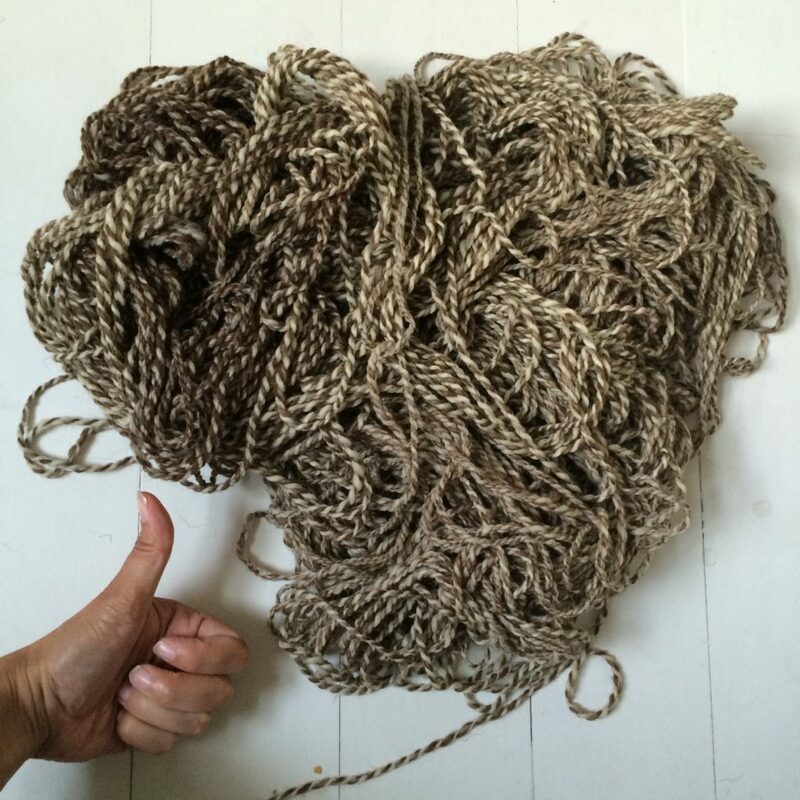 I like a tangle, and the satisfaction of untangling, so with an empty house and work done for the day, I set to. 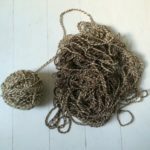 There’s a theory among some knitters that skeins should always be hand-wound, sacrificing the speed of a ball-winder in order to get to know your materials, to experience the wool in a different way before the knitting begins. I can see the attraction of this, but would rarely take the time to do it. 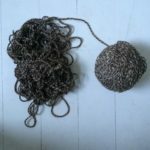 Hand-winding usually happened when untangling other people’s tangles — the initial challenge of laceweight, the sheer length of Hedgehog Fibres. 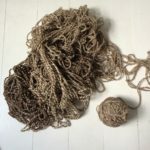 When I’m sorting out someone else’s, I usually think about the person, and how the tangle happened, and imagine what the yarn will become once liberated from its bonds. 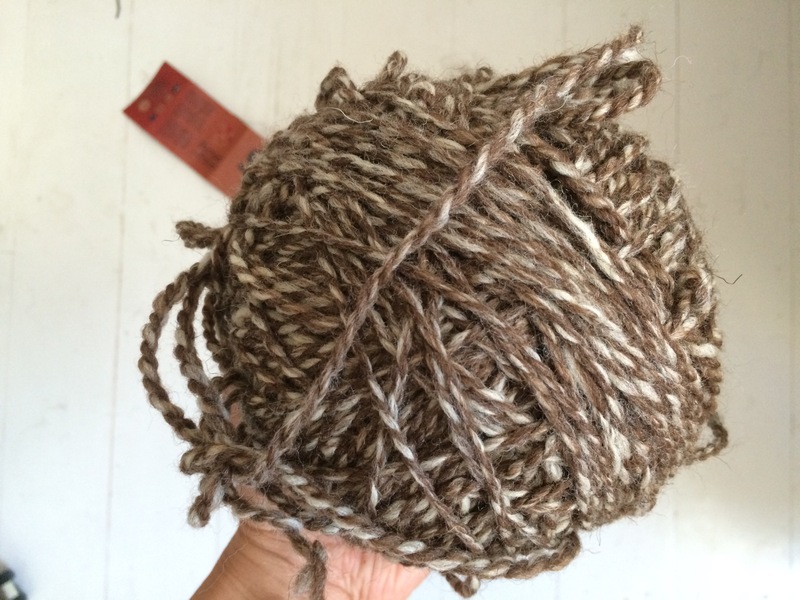 With this one, I knew all those things, so was led into a pondering on how the wool made me feel. 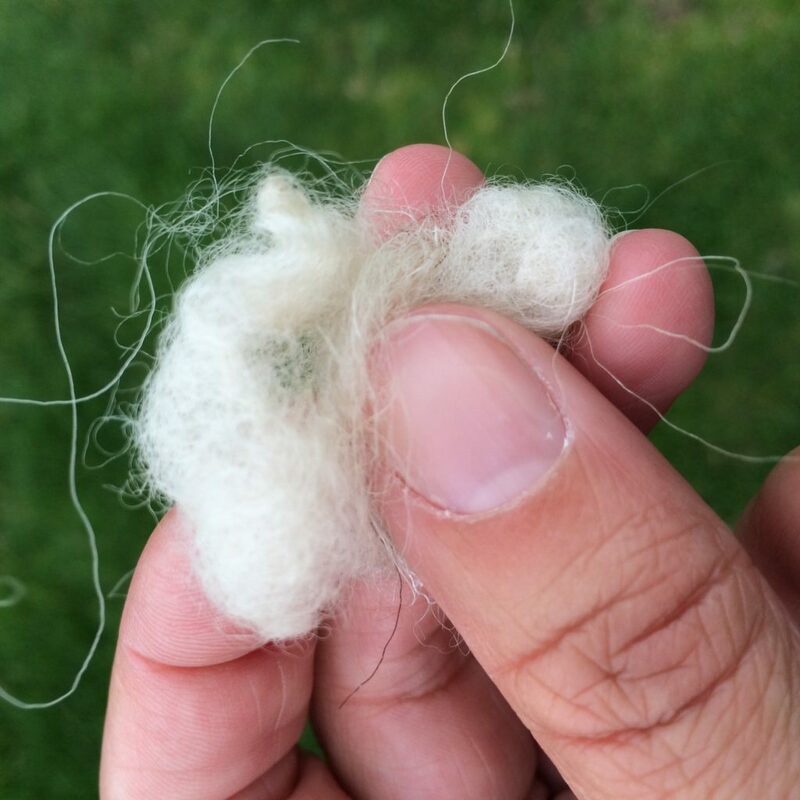 What came to mind, prompted by its scent and the feel of soft, ever-so-slightly oily, fibres? … The warmth of a cushion until recently occupied by a cat. … The wool my aunt Joan used to spin from the scraps she found while out rambling, mostly in the Lake District. I remember her carding the fleece and spinning in her back garden in Hackney, in the sunshine, little bits of fibre floating in the air. Here’s a scrap I picked up out of family habit, while in Yorkshire this month. 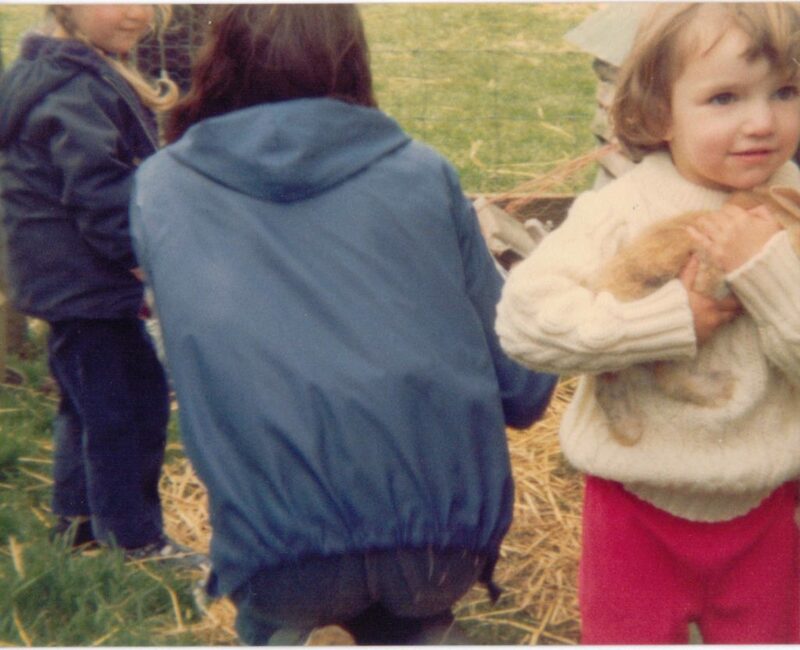 … These pictures, of a three-year-old me with arms full of bunny, wearing what I remember to be a jumper knitted by my mother. … But above all, the safe comfort of a long embrace from someone wearing a woolly jumper, their body heat wakening the sheepiness, in a combination of warmth and soft smell. 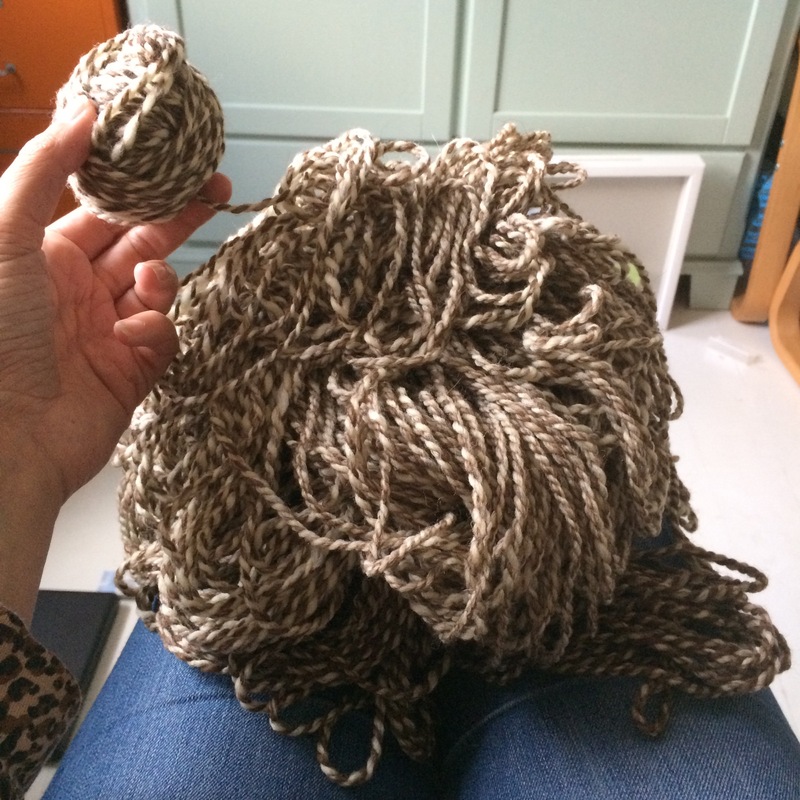 So here is the skein, now a ginormous, melon-size ball. 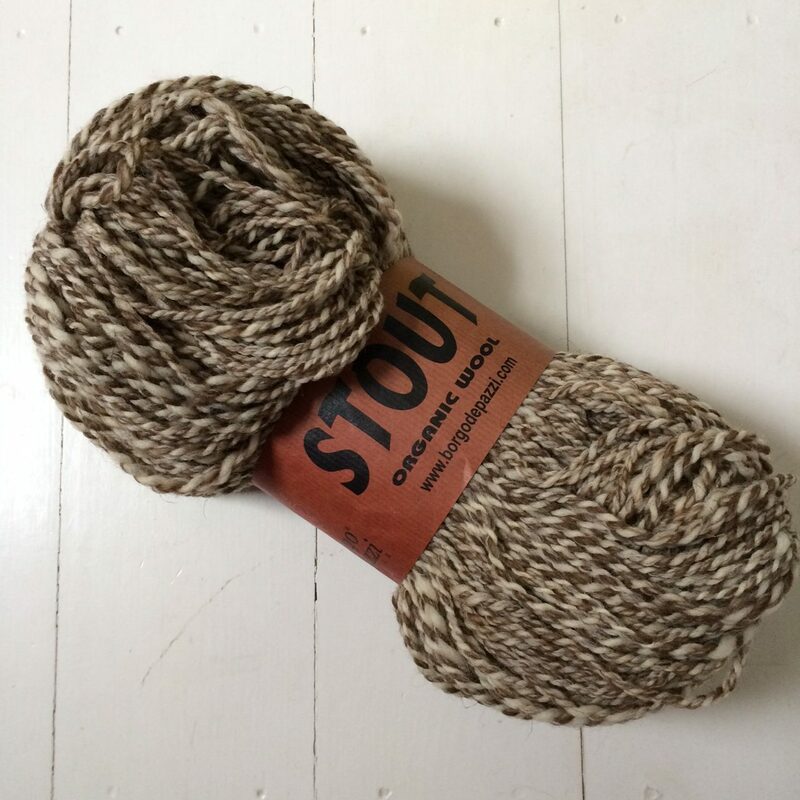 The pattern for that very effective shop sample was designed by Alice Twain, specifically to show off the gradual gradient of the wool, which comes from two undyed shades being spun together. You can find Sciarpa ad Anello, her (free) pattern, on Ravelry. The name made me think of fictional detectives, but means just Looped Scarf. It was 29C in London today, so I have been working from a cool cafe, with meetings and pattern-editing and planning. Modern cafe life, particularly from behind a laptop, feels very modern. But in my bag I have wool, smelling of family, and some of my oldest memories, rolled up into a ball*. 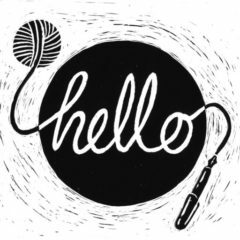 * Can you hear the echo of the ball that Andrew Marvell was entreating his coy mistress to grab?